1. Cut the pork fi llet diagonally into 4 pieces and place in a bowl with the thyme, lemon juice and oil; set aside. 2. Put the cabbage, carrots, red onion, apple and chilli in a large bowl. Stir together the yogurt, vinegar and mustard, then pour over the cabbage mixture, tossing well to combine; add the coriander at the last minute. 3. Heat a griddle pan and cook the pork for 5 - 6 minutes on each side. 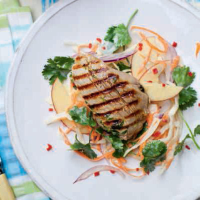 Serve with the apple and chilli slaw.